China's Premier Li Keqiang called on China, Japan and S. Korea to jointly safeguard free trade, expand investment and industrial capacity cooperation. China's Premier Li Keqiang (L), Japan's Prime Minister Shinzo Abe (C) and South Korea's President Moon Jae-in (R) join hands as they pose for photos prior to the start of their trilateral summit in Tokyo on May 9, 2018. Chinese Premier Li Keqiang on Wednesday called on China, Japan and South Korea to jointly safeguard free trade, expand investment and industrial capacity cooperation, as well as enhance innovation cooperation and people-to-people exchanges. Cooperation among China, Japan and South Korea, as neighbors or regional major economies, has resilience and vitality with broad prospects, Li said while addressing a business summit of the three countries. The business summit was held following a trilateral meeting between Li, Japanese Prime Minister Shinzo Abe and South Korean President Moon Jae-in in Tokyo. The Chinese premier urged the three countries to create a peaceful and stable environment for development, stick to the path of peaceful development, respect each other's core interests and major concerns, and properly handle sensitive issues and disputes. As beneficiaries and advocates of globalization with the experience of being under the pressure of trade protectionism, the Chinese premier said, the three countries should jointly push forward globalization and safeguard free trade. "Faced with the severe situation of rising protectionism and unilateralism, China, Japan and South Korea should hold together firmly to support free trade and jointly defend rules-based multilateral trade system," Li said. The Chinese premier also called for accelerating negotiations on a China-Japan-South Korea free trade agreement and pushing for an early agreement on the Regional Comprehensive Economic Partnership so as to promote the building of East Asian Economic Community. On expanding investment and industrial capacity cooperation, Li said, each of the three countries has its own advantages and the prospects for cooperation are broad. The Belt and Road Initiative is creating new room for their cooperation, he added. Concerning innovation cooperation and people-to-people exchanges, Li said China is willing to work with Japan and South Korea in areas including digital economy, artificial intelligence, environmental protection, and medical service and health. China has maintained an annual growth of 7.1 percent over the past five years, contributing to over 30 percent of world economic growth, thanks to its reform and opening up, Li said, adding that it will continue to improve business environment and work to achieve a high-quality development by deepening its reform and opening up. Noting that the year 2019 marks the 20th anniversary of the launch of the China-Japan-South Korea cooperation mechanism, Li urged businesses of the three countries to join hands to not only benefit the three countries but also provide new driving force for world economic growth. 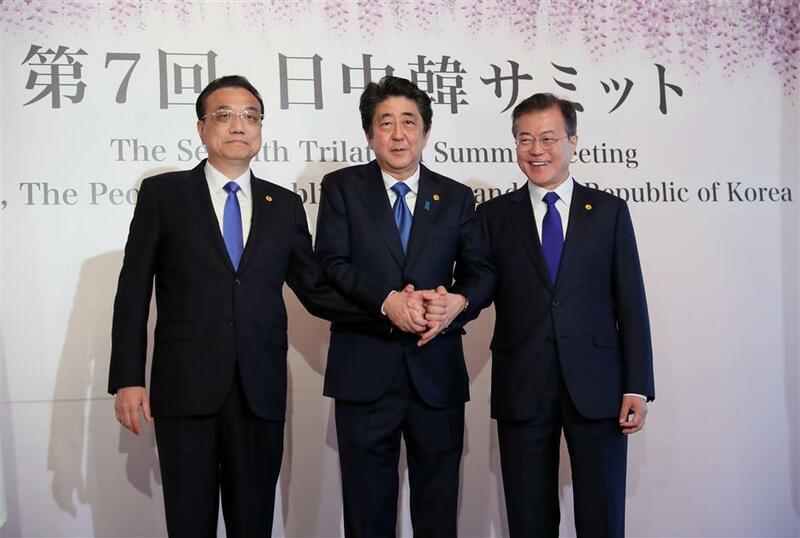 For his part, Japanese Prime Minister Abe said the three leaders have reached consensus on restarting Japan-China-South Korea cooperation, thus bringing new opportunities for their growth and cooperation. Abe highlighted finance, science and technology as well as coping with the challenges of an aging society as areas where the three countries should enhance cooperation. Noting that currently the Korean Peninsula has taken an important, favorable turn for peace, South Korean President Moon said this would create more investment opportunities for businesses. Moon urged the three countries to step up cooperation in such fields as research and development, energy, medical service, environmental protection and disaster management.